I did not know that the Cosmos miniseries—in which the late, great Carl Sagan explains a number of scientific subjects ranging from astrophysics to cellular biology—had a samurai battle in it. In junior high, the school library had a hardcover edition of the book version of Cosmos, which was intended to accompany the TV miniseries. I must have checked that book out over nine th a hundred times. I had always been interested in sciency stuff like this, but rather than have my appetite sated in the many science classes I took, I was cursed with an endless succession of lousy teachers, who believed that “science” meant “answers to questions they will give you on that standardized test at the end of the year that you have to do good on so we keep get a raise” (and I actually recall one of my teachers stating that rather bluntly one day, dattebayo). I like to think of myself as a writer, but one of the problems I keep running into is that the characters in my stories tend to know a lot more about certain topics than I do. Take, for example, Hijū from the Mecha Monogatari. She is an avid motorcyclist, and rides like a demon, but I’ve never rode a motorcycle before. Why, it’s been well over a decade and a half since I was on a bicycle. How to you ride a motorcycle? More importantly, how do you accelerate and brake, change gears, and use that clutch thing? The Internet, though not truly omniscient (like Al Gore had originally intended), is almost omniscient, and it did not take long to find a sufficiently detailed explanation of the processes involved. Of course, I guess I could have actually, oh, I don’t know, actually went out and learned how to actually ride a motorcycle, but I’m terribly lazy, and consulting the Great Sage Google was much easier, and much less likely to end with a funeral. So it would help if I knew what was in the sky. A star chart would be nice. Given that my stories tend to take place in locales far from the United States, and in times quite a bit into the future and/or past, it would be even better if I could program in a location and a date, and see exactly what was up in the sky. 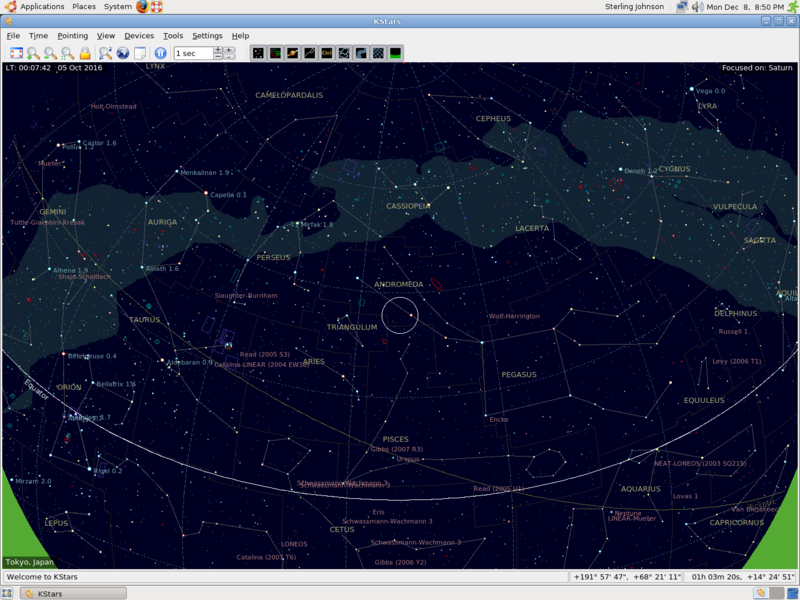 It would be perfectly awesome if I didn’t have to pay outrageous sums for said star chart, too (I’m a cheapskate. Sue me). KStars 1.2.9 to the rescue. It was free, it downloaded and installed quite easily through Ubuntu’s Synaptic Package Manager, and I managed to figure out the basics of how to use it without even having to reference the manual. 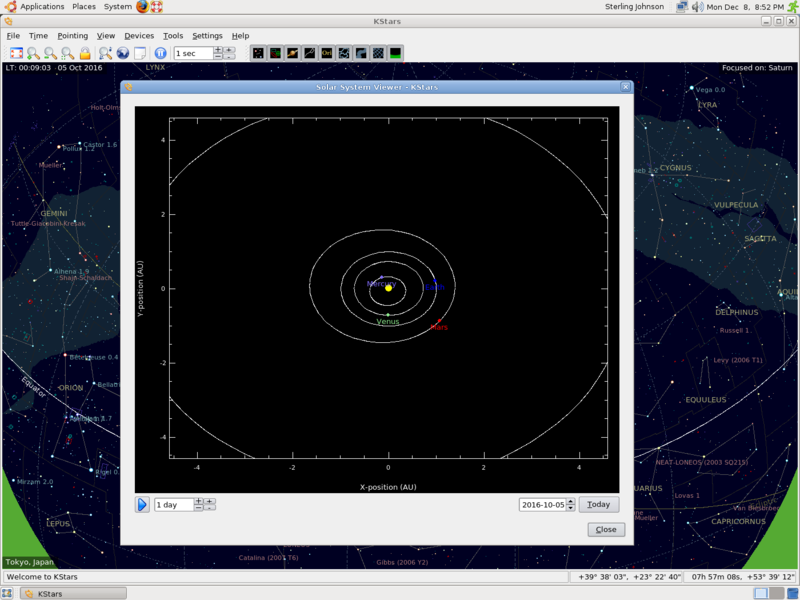 It even has a little tool showing the planets in relation to each other from a top-down point of view. Perfect! Set your location either from a list of major cities worldwide or by inputting the longitude and latitude, adjust the ‘current’ date and time as much as you want, and voilà! You have a nice map of the sky, showing the planets, stars, galaxies, the works. So now I can say with a reasonable degree of certainty that if I were in to Tokyo at midnight on October 11, 2016, and looked straight up I could see the Triangulum and Andromeda constellations (assuming I could see anything past the light pollution of the Tokyo megalopolis). KStars is a terribly useful little tool, not just for astronomy buffs but also for writers who might feel compelled to write about what’s up in the sky. Given that I’m both, I am loving KStars. Answers a lot of questions. 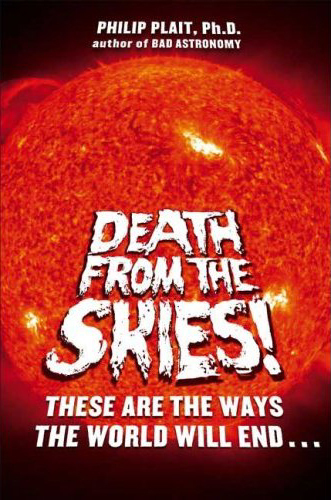 I guess Death from the Skies would have impressed me more if I wasn’t already familiar with the concepts Phil Plait wrote about. Asteroid impacts, supernovae, gamma-ray bursts, the Big Rip—between the Bad Astronomy and Universe Today blogs and the Astronomy Cast podcast, I already had a pretty good idea about the various ways in which the Universe was going to eliminate our existences. Still, a tale well told is worth hearing twice, and Phil does do a great job of introducing and explaining these end-of-the-world scenarios, and there is some new-to-me information, such as the idea that it was possible to slowly increase the Earth’s distance from the sun by using asteroids to steal orbital energy from one of the outer planets, like Jupiter, for example, and then give that energy to the Earth. Give your asteroid the right orbit, and for every time around, Jupiter moves a little closer to the Sun, and the Earth moves a lot father away from the Sun—a useful strategy, if you’re trying to keep your planet away from its bloating-into-a-red-giant parent star. Another small nitpick: I am fairly familiar with Phil Plait’s voice. I’ve heard him speak (well, recordings of him speaking) on a number of occasions, and when I read, for example, his blog, I can readily “hear” his voice in my mind. But while reading Death from the Skies, it just didn’t “sound” like Phil, except for a few sections, primarily the footnotes. A strange complaint, and one that really doesn’t detract from the book, I know. Still, I would have to give this book an A−: good, interesting material about the end of the world (indeed, the end of everything) as we know it, explained well, but just lacking that little extra zing that would make it great. Phil has an excerpt up over at his Bad Astronomy blog, for those who want to take a look. Yes! I got my copy of Phil Plait’s new book, Death from the Skies: These are the Ways the World Will End, in today. Phil is the author of the Bad Astronomy website and blog and in August was named the newest president of the James Randi Educational Foundation. He also wrote a book that came out in 2002, Bad Astronomy: Misconceptions and Misuses Revealed, from Astrology to the Moon Landing “Hoax”, which…I haven’t bought…yet. But I’ve been a fan of Phil (is it weird that I call him Phil?) for a while now. His enthusiasm and sense of humor turn a subject that too often is made to be boring into something truly fascinating. I have only read the first couple pages so far, but once I get out of the introduction and through some more of the astronomical death and destruction, I’ll write a more thorough review. It might be a couple of days, though.